I’ve spent lots of time with some of the world’s most successful coaches. I discovered that many of them think about character a lot, especially traits that are important to winning – like self-discipline, perseverance, resiliency, and courage. They pay less attention to virtues like honesty, integrity, responsibility, compassion, respect, and fairness – aspects of character that make a good person, citizen, spouse, or parent. The problem is that, even at the amateur level, many coaches are hired and paid to win, not to build character. Unless it interferes with performance, to worry about the kind of person an athlete is off the field is a waste of time. Coaches who seek to hone the mental and physical skills of winning while ignoring moral virtues of honor and decency too often produce magnificent competitors who are menaces to society. Perhaps coaches of elite athletes not connected with educational or youth-serving institutions can operate in this moral vacuum, but all others have a responsibility to teach, enforce, advocate, and model all aspects of good character, including trustworthiness, respect, responsibility, fairness, caring, and citizenship. Whether it’s sports, business or politics, whenever we divorce issues of competence from issues of character, we create a class of amoral professionals who think they’re exempt from common standards of honor and decency. This discredits and demeans the moral standing of everyone involved. 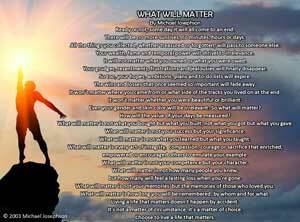 Please return to the Blog Home Page www.whatwillmatter.com and browse to see other current and archived commentaries, quotes and other good stuff.